The Huawei P9 is a pretty neat phone. Featuring a metallic body, dual camera setup and a fast fingerprint sensor are just some of the highlights of what the phone offers. However, the flagship from Huawei is not quite prepared for trips and slips, as I sadly discovered a few weeks ago. A simple drop on concrete (oops) easily caused some scratches around the corners. The solution? To keep your phone in a case at all times. Following is a collection of some awesome cases that should cater to all users. The best part? They are all under £10! I have a particular liking for clear cases. They offer you protection, but also allow you to show off how beautiful a phone is. Sometimes, they just add a tiny little bit to the beauty of the product. The case offers scratch resistance, as well as combines a TPU bumper ensuring that the phone can withstand all kinds of knocks and drops. As far as fitting goes, it is custom designed to fit the P9, and it slips on pretty easy. The ports are all open, including the camera and the fingerprint sensor, ensuring nothing gets in the way. The buttons are pronounced on the case itself, though pressing them requires more effort than if it was without the case. Taking it off is not as easy as putting it on, but a lot easier than a lot of other cases we have tried. 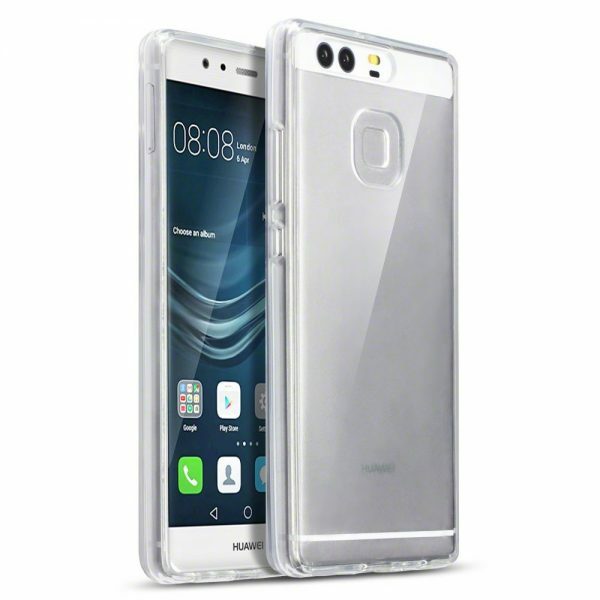 All in all, this offers a great protection and is a simple no frills case for the Huawei P9. More on it can be found on the Terrapin website, and it is available from Amazon for £6.95. If you’re after something more sleek, luxurious and business like, a leather wallet case is the one to go for. 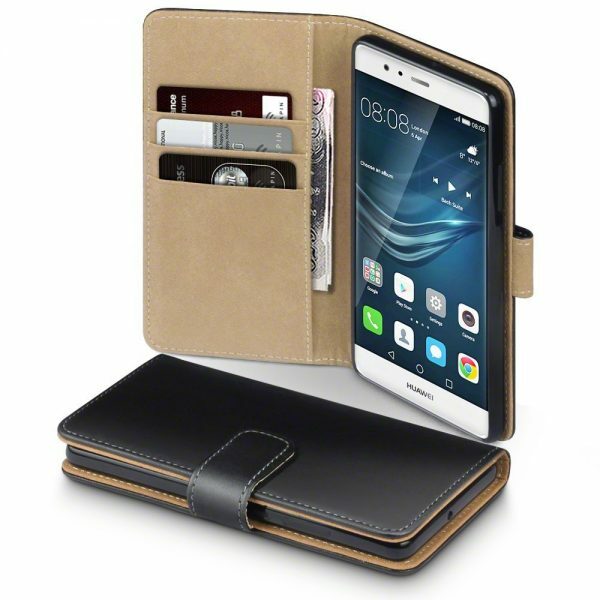 The case offers a professional look, featuring black leather on the outside, tan on the inside. It not only has slots to add both credit/debit cards and money, but also has a magnetic flap to make sure the phone case closes automatically when not in use. As far as the fit goes, it is custom designed for the P9 and works really well. It pops on easily, and once on, all the ports are exposed, while the buttons are covered. Since the phone sits in a small plastic shell, the buttons can easily be pressed through it. 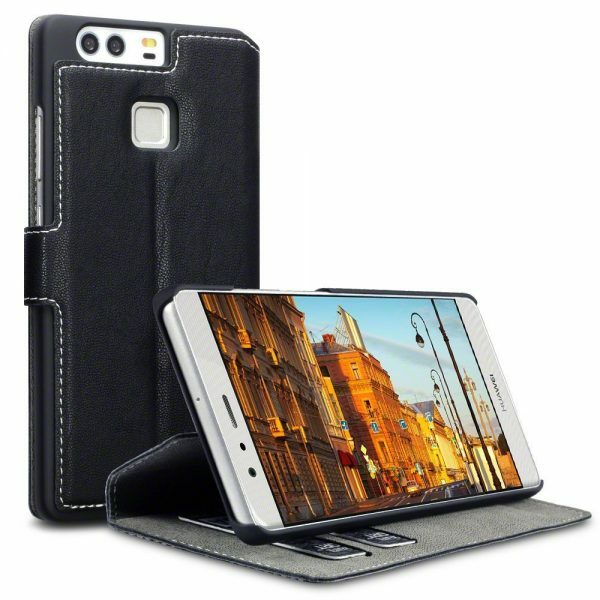 Whether open or closed, the phone is well protected due to the plastic shell as well the leather casing around it. The leather shows off good quality, and the stitching is done well. Whether the phone is open or close, the magnetic flap automatically attaches to the case, rather than being an annoyance. It does advise to keep any credit/debit cards in the case with the magnetic strip facing towards the phone to avoid any damage due to the magnet on the case. This could be bit of an issue as you’ll have to place the cards the wrong way when you put them in it. Either way, it is a great wallet to carry your phone around in, specially if you don’t feel like carrying an extra wallet with your money. More on this can be found on the Terrapin website, and it is available from Amazon for £7.95. Wallet cases are great. They provide protection as well as give you a place to carry money and cards, meaning you don’t need to carry two things. However, they are often bulky and quite thick, meaning they can be uncomfortable to carry around in trouser pockets. The solution to this conundrum is the low profile wallet. Much like the wallet case above, it features a leather construction on the outside, but a suede like fabric on the inside, giving it a sleek look. It not only takes credit and debit cards, but also acts as a phone stand. Unlike the case above, which fully encloses all the buttons, this gives you slots for all the ports as well as the buttons, maintaining the original feel of the device. This is a touch I definitely prefer in cases, as it means you don’t need to press any harder just to access a button. The fit itself is perfect, and very snug. In fact, it was quite hard to take off, and needs a bit of a technique. The case is a lot thinner than most wallet cases out there, which is exactly what it offers. The magnetic flap is there to help keep the device safe when the cover is closed, as well as be non-intrusive when open. The magnetic flap does mean that one needs to be careful with how the cards are placed in the device. All in all, it is a very practical case and offers a happy medium between the above two, making this an ideal case for anyone who wants protection and good looks, but with very little extra bulk. More information on this can be found on the Terrapin website, and it is available from Amazon for £8.95.